The Emmerson Mnangagwa-led government has moved to restrict former President Robert Mugabe's signature indigenisation law which forces foreign businesses to ensure 51 percent equity ownership by black locals. Presenting his 2018 budget statement Thursday, Finance Minister Patrick Chinamasa said the controversial 51-49 percent local-foreign shareholding structure shall only apply to diamond and platinum mining. He lamented the flight of foreign direct investment from the country in the past few years and pledged to relax the country's tough policy regime which is blamed for poor investment in the country. The minister said government was to come up with policies that encourage both domestic and international investment. This, he said, shall come with the amendment of the country's Indigenisation and Empowerment Act which prescribes majority share ownership by locals. "In the extractive sector, that is mining, the proposed amendment will confine the 51-49 percent indigenization threshold to only two minerals, namely diamond and platinum," Chinamasa said. "The 51-49 percent threshold will not apply to the rest of the extractive sector nor will it apply to other sectors of the economy which would be open to any investor regardless of nationality." 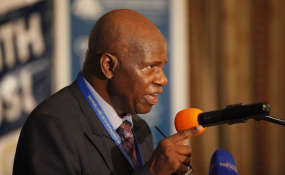 Chinamasa said the reserved sectors shall only be enjoyed by locals with foreign nationals interested in joining these areas expected to comply with certain requirements tailored to benefit the economy. "For non-Zimbabweans, entry into the reserved sector will only be by special dispensation granted by government if the proposed business; 1, creates employment; 2, affords the opportunity for the transfer of skills and technology for the benefit of the people of Zimbabwe; 3, that the business will promote the creation of sustainable value chains and, fourthly, that the business meets the prescribed socially and economically desirable objectives." Chinamasa said government will allow those already in the sector to continue uninterrupted but they must formalise their enterprises and bank their proceeds with local institutions. The reserved sectors are agriculture (primary production of food and cash crops), transportation, retail and wholesale trade, barbershops, hairdressing and beauty salons, employment and estate agencies and grain milling as well as bakeries, tobacco grading and packaging, tobacco processing, advertising agencies, milk processing and provision of local arts and crafts, marketing and distribution. Zimbabwe's controversial indigenisation law is blamed for the flight of foreign direct investment in the once promising economy with industries that once employed millions now reduced to wasteland.